The youngest European State has been slowly but gradually becoming a Member of various International Organizations, and now it is facing its first investment treaty arbitration claim. Kosovo has been a member of the IMF and the International Bank for Reconstruction and Development since 2009 and became a member of the ICSID by signing the ICSID Convention in July 2009. In addition, Kosovo was recently admitted as the newest Member State of the PCA. This theoretically paves the way for foreign investments but will, as it already has, raise difficult questions of international law such as treaty succession and international recognition. 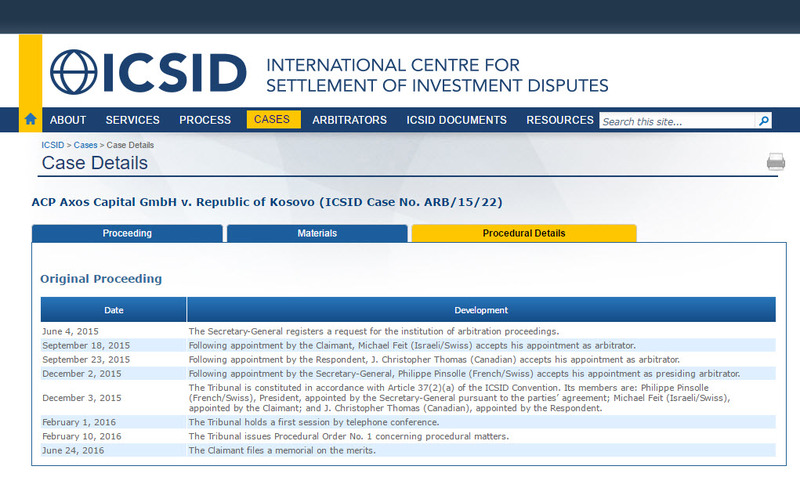 It was not long after Kosovo signed the ICSID Convention that it faced its first investment claim. German Investor Axos Capital Partners filed a claim against Kosovo seeking €180 million (US$200 million) in damages. The claim was brought under the 1989 Germany- Yugoslavia BIT, which the investor argued Kosovo was bound to by the laws of State succession. The case concerns the privatization of Kosovo’s post and telecommunications company (“PTK”) for which the Claimant won a tender to buy 75 percent of its shares. However, the Kosovar government pulled out of the deal and, in mid-2014, PTK entered into a new contract with Alcatel-Lucent and Nokia Siemens Network Services. In addition, PTK’s trade union protested against State companies being sold, stating fears that privatizations would lead to a cut in job places. The ICSID Tribunal was constituted in December 2015, chaired by Phillipe Pinsolle (Franco-Swiss), Michael Feit (Swiss-Israeli), appointed by the Claimant, and J. Christopher Thomas (Canadian), appointed by the Respondent. The case is pending. Claimant only filed its First Memorial in June 2016, thus it remains to be seen how the Tribunal will deal with the difficult jurisdictional questions and complex questions of international law regarding Kosovo. Kosovo has been officially recognized by 113 UN Member States and by 23 out of 28 European Union states.